The best thing about the Outfits in Final Fantasy 15 is that you don’t have to pay them with your money! Unfortunately, Gil is usually very tight and you need enough for the weapons in FF 15. Generally, new Outfits can unlock by playing the main story. However, there is also a pre-order bonus or you have to go into a certain area to unlock outfits. There is a big difference between the Outfits of Noctis and his companions. The main character can get a total of nine outfits. Two of these are part of the pre-order bonus. 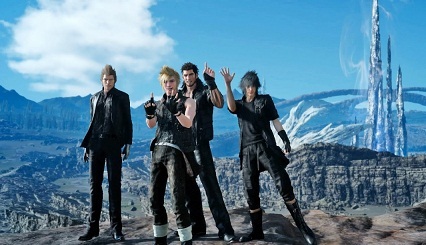 Ignis, Prompto and Gladiolus have seven outfits that all three of them can wear. The unlock conditions are by no means secret and you are not in danger of missing something. With the new outfits you can influence the status values of your characters and thus achieve optimal values with the right combination of weapons and accessories. In some parts of the game, you will have to change your clothes spontaneously, so that you can adapt to the respective situations or hunting assignments. In our table below we show you all outfits, the unlock conditions and status values for Noctis. Casual Outfit Protection from fire, frost, shock and attack and mollified protection. Available from the beginning. Casual Outfit (without Jacket) +20% Critical hit rate. Available from the beginning. Prince's Fatigues +20% HP. Available from the beginning. Princes Fatigues (without Jacket) +20% Strength and +20% Magic. Available from the beginning. Thermal Suit +20% HP and protection against fire. Complete missions and hunting orders in the power plant. Kingly Raiment +20% spirit and +20% vitality. Play the main mission "Reunion". Kingly Raiment (without Jacket) MP-Recovery Rate +6% and HP-Recovery Rate +3%. Play the main mission "Reunion". There are fewer outfits available for your companions, but you can distribute them among each other arbitrarily and thus assign the appropriate roles. Crownsguard Fatigues +20% HP. Available from the beginning. Crownsguard Fatigues (without Jacket) +20% strength and +20% magic. Available from the beginning. Kingsglaive Garb +20% vitality and +20% spirit Play the main mission "Reunion". Kingsglaive Garb (without Jacket) MP-recovery rate +6% and HP-recovery rate +3%. Play the main mission "Reunion".